I’m at that age where most of my friends that I’ve known since high school are somewhere in the process of starting family life — they’re engaged or already married; they’re pregnant, have their first and, in a few cases, are expecting their second. 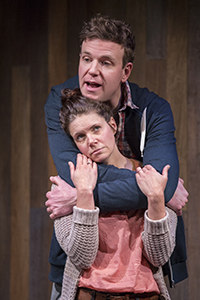 At some point in their lives, they had the same whirlwind conversation that is the driving force behind Lungs, presented by Tarragon Theatre, that inevitably starts at the same point: “let’s have a baby”. From that point onward, life gets complicated and awkward, to say the least. Lungs is 75 minutes sans intermission at the Tarragon Extraspace. The entirety of the production centers on the conversation between two people: the woman known simply as W (played by Lesley Faulkner) and the man, M (Brendan Gall). That’s all you need to know about them; in essence they’re archetypes. M opens up a can of worms to W in the form of bringing up the B-word for the first time. W panics and is far from amenable to the idea. In 75 minutes their lives flash before our lives often times jumping from hours to days to years in the span of a quick change in the conversational tone. It’s as if someone else is controlling the Fast Forward button to a movie you’re only seeing for the first time. The stage is bare – just the walls and floor of the Tarragon Extraspace. There are no chairs or or blocks or anything to denote any sense of a “set”. When the couple move from standing in line to sitting in the car, they’re still standing in pretty much the same spot. When they switch to the ‘bedroom’, they’re lying on the floor. All transitions throughout this piece are reliant on the cues from their conversation. And it’s the writing of this play that makes me uncomfortable. From watching the dynamics of the couple on stage there are a few choice words I can use to describe W: shrill, manic, hormonal, accusatory. And since she is simply just “woman” rather than an individual, she is to represent how all women are when faced with the idea of first time pregnancy. She made me uncomfortable. M could only stand there and deal with the backlash of W’s onslaught. This is not a healthy relationship in the slightest. This is not a couple that should in any way be considering starting a family. If these aspects of their characters are only coming to the surface at the mention of the word “baby”, they should have been dealt with long before and that would’ve been a really interesting story to see but all of that happened in the parts that seemed to be fast forwarded through. And that’s a problem both my friend Grace, who attended the show with me, and I had with the writing. What we also agreed on was the performances offered by Faulkner and Gall; they were the heart and soul of the show. Both actors did a fine job with the script that they had and were able to keep the energy high and intense throughout the show as both were constantly on stage throughout – the joys of no transitions at all. With a completely bare stage, these two performers are the only things that will capture the audience’s attention and never did they drop the ball or lose momentum. Their line delivery was often rapid fire, as plenty of the script was written through arguments, with plenty of talking over each other. It’s enough to leave the audience waiting for a moment to catch their breath. It was certainly enough for me to find a great amount of profound sincerity in W’s final moments on stage when she was able to, finally, slow down. Thing is, I can’t get over the writing. The intended focus is on the amount of political and environmental unrest that is plaguing the world that this couple will have to bring a new life into, which is a valid point to make. But W’s shrill, panicky attitude to family life and pregnancy that she takes out almost violently on M is problematic. I’ve seen this couple in real life and I’ve worried for them. Lungs is being brought back by Tarragon Theatre for another year due to popular demand from their original run last year and I have to say, that demand must come mostly from Faulkner and Gall’s intense performances. For those alone, Lungs is worth checking out. Lungs is being presented by Tarragon Theatre (30 Bridgman Ave) in the Extraspace. Performances run until January 25. Show times are Tuesday to Sunday at 8 pm with additional weekend matinees at 2:30 pm. Tickets are $52 and $29 for students during regular performances, $47/$29 for students during matinees. Tickets can be purchased online, by phone by calling 416 531 1827, or by the Ticket Trove app on your iPhone or iPad.